Last week, when I talked about ideological bubbles and how to tell if you’re in one, I should have mentioned the best way to stay out of bubbles in the first place: Expose yourself to as many original sources as you can, especially the ones you know you’re going to hate. General impressions. Before I get into specifics, I want to say a few things about the overall impression the document makes. As many people have already observed, Ryan’s proposal is not an attempt to reach a workable compromise with the White House or the Democratic majority in the Senate, both of which would have to agree before his plan could become law. Instead, it’s an aspirational document for conservatives: This is what they fantasize doing if and when they get complete control of the government. There’s nothing wrong with that, but the Ryan Budget needs to be classed with aspirational budgets from the Left, like People’s Budget put out by the Congressional Progressive Caucus (which also balances the budget in ten years). Both are shots across the bow, not plausible projections of what its backers think they can pass. This is a plan to balance the budget in ten years. It invites President Obama and Senate Democrats to commit to the same common-sense goal. 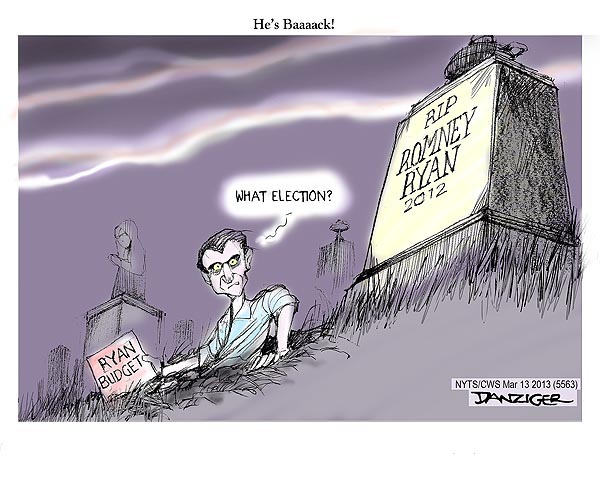 But there is no spirit-of-invitation in Ryan’s style. Any liberal who reads it will get pissed off, and I believe that’s intentional. Conservatives couldn’t fully enjoy their reading experience without visualizing pissed-off liberals. Let me detail that: You’ve probably already heard that Ryan wants (once again) to try to repeal the Affordable Care Act (a.k.a. ObamaCare). But after the first mention, he can’t just call it by name. It’s “the President’s onerous health care law” (page 33) or “the President’s misguided health care law” (page 40) and so on, as if the ACA had been imposed on the country by imperial decree and Congress had nothing to say about it — also as if the ACA hadn’t been an issue in the 2012 election that Romney/Ryan lost by nearly five million votes. Other partisan stuff is just silly. On page 24, President Reagan is given credit both for the economic expansion of his era, and of President Clinton’s era as well. Clinton is mentioned exactly once (on page 33, when Ryan re-raises the universally debunked lie from campaign 2012 that Obama wants to rescind the work requirement of Clinton’s welfare reform). The reader would never know that Ryan’s stated goal — a balanced budget — was achieved by Clinton (who raised taxes) while Reagan (who cut taxes) ran up record deficits. You will also hear echoes of 2009’s Lie of the Year: death panels. The ACA sets up an Independent Payment Advisory Board (IPAB) to make annual recommendations (which Congress can rewrite before they take effect) on keeping Medicare spending within specified limits. The law specifically bans the IPAB from recommending care-rationing, but the heading of the Ryan’s section on it (page 40) is “Repeal the health-care rationing board”. Background assumptions. In the real world, if a program is important enough, the government could conceivably raise taxes or borrow to pay for it. OK, Ryan’s balanced-budget goal won’t let him advocate borrowing. But a fundamental assumption that runs through his whole budget — usually without being stated explicitly — is that taxes cannot be raised for any purpose. Nothing is important enough to raise taxes to pay for. So if the domestic demands on government are growing — the population is getting older, the infrastructure more decrepit, healthcare more expensive, weather-related disasters more extreme and more frequent, future economic growth more dependent basic research and an educated workforce etc. — any money you want to spend to deal with one of those challenges has to be taken from the others. The idea that over the long term our country could decide that it wants to do more of its consumption publicly — that it wants to take its economic growth in the form of Medicare and public education, say, rather than BMWs — is completely off the table. Medicare and Social Security are usually considered “mandatory spending” (because benefits are defined by law rather than by appropriation), but I believe the additional $962 billion of 10-year savings is mostly Food Stamps, Pell grants, and so on. So the cuts are almost entirely in healthcare, education, or anti-poverty spending. And while Ryan waves his hand at replacing Obamacare with “patient-centered health-care reforms” (page 33), apparently those reforms require no money from the government. Meanwhile, rich people get a big bonanza: The top tax rate drops from the current 39.6% to 25%. If you make $10 million a year (some CEOs do), you could save nearly $15 million over the ten years Ryan’s budget covers. So what isn’t in the budget document? Any specifics about discretionary spending cuts. The cuts are just numbers on a spreadsheet. All the “tough choices” necessary to achieve those numbers are left to your imagination, so Ryan can deny his intention to cut anything in particular, as Mitt Romney did in his first debate with President Obama. Any specifics about closing tax loopholes. Ryan claims his rich-guys-bonanza 25% tax rate wouldn’t cut federal revenue, because it would be balanced by eliminating tax loopholes. As in the 2012 campaign, Ryan says nothing about what those loopholes might be. Again, he can deny wanting to cut any specific item, like the mortgage interest deduction. But he’s got to raise that revenue somehow, and I seriously doubt it’s all going to come from the super-rich who benefit most from the lower rate. We have always been at war with Eastasia. The background rob-Peter-to-pay-Paul assumption allows Ryan to construct some truly Orwellian statements. This is particularly true in the “Opportunity Extended” section, which is all about shrinking opportunity for poor and working-class young people. Many economists, including Ohio University’s Richard Vedder*, argue that the structure of the federal government’s aid programs don’t simply chase higher tuition costs, but are in fact a key driver of those costs. What could that possibly mean? Well, that federal aid is allowing too many people to go to college, creating a high-demand environment in which colleges can raise tuition. So the “solution” is to lower the maximum Pell grant (thereby “saving” the Pell grant program from spending at an “unsustainable” level, since we couldn’t possibly raise taxes to pay for it). Also to “target aid to the truly needy” by making families report more of their income on financial aid forms. Also “reforming” student loans and “re-examining the data made available to students to make certain they are armed with information that will assist them in making their postsecondary decisions”. Presumably, when the facts of this harsher you’re-on-your-own world are “made available to students”, fewer of them will decide to go to college, thereby saving both their money and the government’s. So don’t worry about student debt — just don’t go to college at all if you’re not rich, and if you do go we’ll “help” you avoid massive debts by refusing to loan you money. Oh, and we’ll also “encourage innovation” in education through “nontraditional models like online coursework”. Never mind that’s where the big scams are. Corporations profit from those scams, so that’s not “waste”. Ditto for job training: Ryan promises to “extend opportunity” by spending less on it. So if, say, low-income Texans need to toughen up and stop seeing a doctor at all, Texas can tailor its program that way. That’s what it’s doing already with the “flexibility” the Supreme Court gave it last summer. Energy. Climate change just isn’t happening. Ryan doesn’t make that claim in so many words, but there’s a big empty spot where climate change would otherwise have to figure in. Of course my baby-boom generation knows how that works, because all that debt America ran up during World War II was “stolen” from us, right? I don’t know how I failed to notice. In the real America, the big deficits of World War II kicked off 40 years of prosperity, during which the country achieved a level of equality that it hasn’t equalled before or since. So no, deficits are not “stolen” from the future. My generation did not build tanks and landing crafts and put them in time machines to send back to D-Day. But in order to save our children from the horrible maybe-sorta-problem of the national debt, we need to under-educate them; not do basic research that might create the next computer industry or Internet; leave them crumbling roads, bridges, and electrical grids; not care for them when they get sick; move in with them when we get old; and leave them with a torched planet, where Iowa is a desert and Miami is underwater. I’m sure they’ll thank us for our foresight. * As best I can tell, although Ryan identifies only their university affiliations, every economist Ryan mentions by name is inside the conservative bubble. Richard Vedder is with the American Enterprise Institute and John Taylor with the Hoover Institute. Doug, you have quickly become one of my favorite blogs. This is excellent writing. Thank you.